One piece of equipment helps keep day to day operations running smoothly: your cash register or computer. Now it's easy for retailers to access their computer or cash register easily, without affecting the aesthetics of their store. 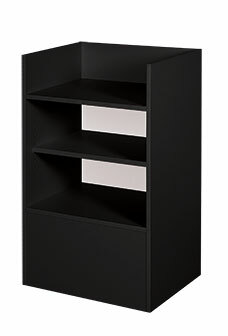 Our Black Well Top Register Stands are available in black, matching our other display case units, and feature adjustable rear storage shelf, perfect for storing personal goods, tools, or supplies. The low pressure black melamine laminate finish will enhance the aesthetics of the showroom floor, matching almost any fixture within your retail store. Overall, the register stand measures 38"H x 18"D x 24"L. Crating for secure shipping is included in the price of the case. Fully assembled and ready for shipment.